T-Shirts printed by Smit-T’s of Auburn were sold at the game for a minimum donation of $10. 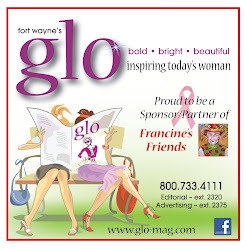 All proceeds went to Francine’s Friends mobile mammography to help support screening mammography for all women. Click here to view photos of the evening on Facebook. The “Shoot for the Cure” game marked the first of many events scheduled in DeKalb County this spring — culminating on May 21st with the official "Tri Kappa Presents PINK OUT DeKalb 2015" in Auburn. The Francine’s Friends Mobile Mammography coach will be at the ACD Automobile Museum providing screening mammography, along with a Health and Wellness Fair at the Community Foundation, shopping with Friends and DABA in downtown Auburn, a cruise-in, and closing ceremonies — all to benefit screening mammography. A pre-event "Zumbathon" will be held on Saturday, May 2, from 6-10 at the Auburn YMCA, with proceeds going to Francine's Friends.